Leigh Community Art Group: The Painting Starts Here! Our new year starts with the first club meeting on Monday 13 January 2014. An easy going place to start or develop your artistic skills by learning at your own pace. We will supply help and support if you need it or, if you prefer, you can do your own thing. Most evenings are not formal classes and members are free to work in most media except oils as they never get on well with the carpet! Advice is always there and all you have to do is ask. We have a formal constitution which is open to inspection. Our committee is elected every year. Anyone can participate as we have no “pecking” order. To promote amateur art across the Atherleigh / Wigan areas and beyond. Although the core of our members are locals we welcome new members from further afield. Our emphasis is on the enjoyment of creating art in a sociable environment. We exhibit throughout the year at various weekend shows and our main annual exhibition in Leigh Library. All members are welcome to exhibit from when they join but this is not mandatory. All we ask is that they be participating members in various aspects of our club’s weekly activities. We have a very reasonable annual membership fee of £10.00 and an additional weekly attendance fee of £2.50 which goes towards the cost of the room and provides complimentary tea, coffee and biscuits. If you are a beginner, please don’t buy anything before you come along. Everything can be provided free for a couple of weeks to allow you to decide whether you want to stay. At that point you can join the club and you will be advised as to what materials you will need to avoid any unnecessary expense. You will be surprised how little it all costs to get started. If you fancy having a go then don't put it off. You have nothing to lose and so much to gain. Please remember everyone has to start somewhere. We look forward to seeing our existing members and look forward to meeting many more new ones in the coming months. 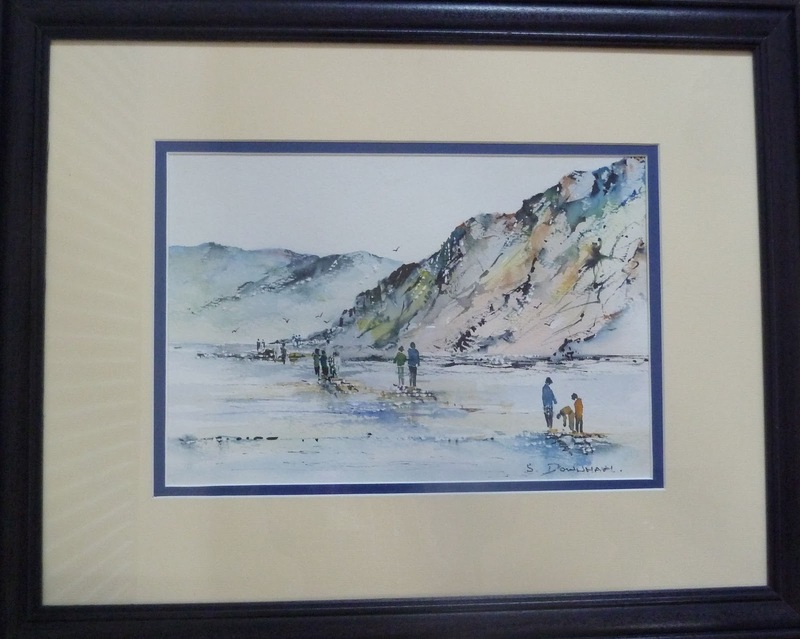 Meanwhile here is "The Beachcombers" in watercolour by S.Downham, one of our club members.